Vicki Delany – Canadian Author of Mystery Novels and Suspense Novels » Something Completely Different! I’ve gone over to the light side! I have two three book contracts from Penguin (one for Obsidian and one for Berkeley Prime Crime) to write a cozy series. This is a big step for me, and something very different for my readers. I am having a lot of fun with these books and I hope my regular readers will also. The first series is the Lighthouse Library Series, set in a library in a lighthouse on the Outer Banks of North Carolina. I am writing this series under the pen name of Eva Gates. 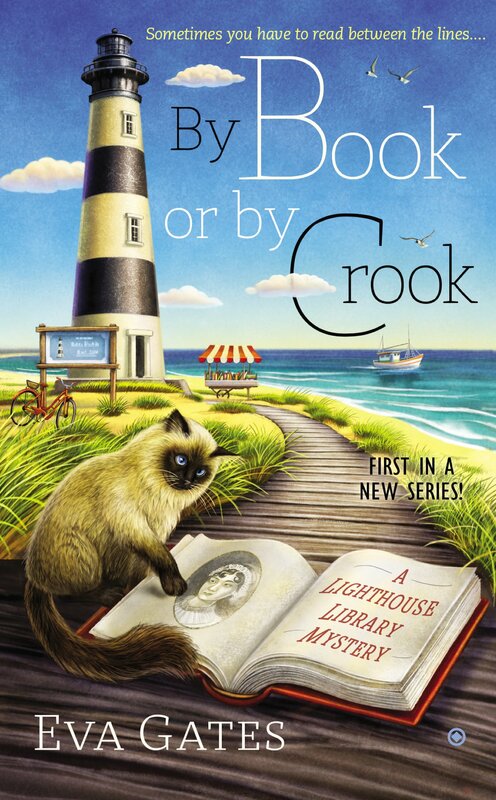 The first book in the series, By Book or By Crook, was released on February 3, 2015. Booked for Trouble will be out Sept 1, 2015, and Reading up a Storm, in April 2016. Eva Gates has her own web page: http://www.lighthouselibrarymysteries.com/ Check it out for updates on the book and some great pictures of the Outer Banks. P.S. If you are wondering, I haven’t given up Molly Smith and John Winters and Trafalgar, B.C. They will be back in February 2016 with Unreasonable Doubt!